A ringer’s first peal is a major milestone. It is a big step from ringing a quarter peal (45 minutes) to a peal (3 hours), but it is a step any aspiring ringer wants to take because the peal is the ‘gold standard’ ringing performance. There are more or less complete records of every peal ever rung, since the first one in 1690. Saturday 31st January, the morning of the annual tower dinner, provided an opportunity for our youngest ringer, Mhairi Miller, to attempt her first peal. The ringing took a while to settle down, but after an hour or so was flowing steadily with hardly any trips. Mhairi was going strong, and grinned at the conductor just before the half way point. The third quarter was going well when sadly the conductor miscalled, and the attempt was lost after two hours ringing. That deprived Mhairi of her first peal, but having rung for two hours, her next attempt won’t be a big step. 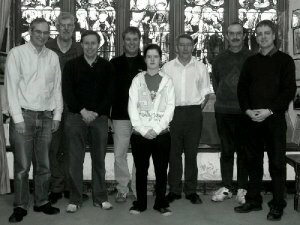 The band is pictured here just afterwards. (*=St Paul’s ringer).